(Host) Even in the best of times, running a family dairy farm isn’t easy. As milk prices see-saw, fuel and feed costs just keep going up. So when fire destroyed an historic farmhouse in Woodstock earlier this month, some people wondered if the devastated owners would call it quits. But the Bassett family is not giving up, at least not yet. VPR’s Charlotte Albright dropped by at milking time to see how they’re faring. (Albright) Looking at the charred remains of the two-hundred-and forty-year-old farmhouse on Route 12, you would never guess that in the back of the property, life-or at least work-goes on. Robert Bassett, a 41-year-old third-generation farmer, is bulldozing an area behind the rubble so that the 200 cows can make their way from the barn to the milking parlor.His seventy-seven-year old mother Anna greets a cow poking her nose through the pen. (Anna Bassett) "Hi, sweetheart. They are so nosey." 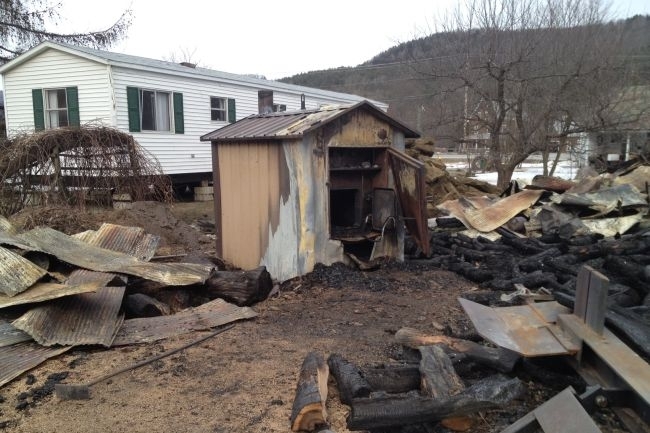 (Albright) Fire officials suspect the fire was sparked by an outdoor wood furnace. Miraculously, there were no injuries. While the embers were still smoldering, a local motel owner gave farmers Albert and Anna Bassett, and their, son Robert, free shelter. (Anna Bassett) "The bedroom was filled with bags of clothing. People were bringing in food. People were bringing in money and it makes you very humble but it’s kind of hard because we’re not used to accepting." (Albright) But they’ve had no choice. They are insured, but it’s not clear whether the coverage will be enough to replace all their belongings and re-start the business. It has defrayed the cost of buying a tiny trailer that rises above the debris and serves as their temporary home. (Anna Bassett ) "It’s really important to be here, to be with our cattle." (Albright) And to keep selling milk. Tropical storm Irene washed away the Bassetts’ hay field, so money is tight, and Robert Bassett is working day and night. (Robert Bassett) "The cows have to be taken care of every day. You cannot stop. The only way you stop is to sell the cows." (Albright) He says it’s too early to make tough decisions about keeping the farm and building a new home. Meanwhile, money is pouring into a fund started by state Representative Alison Clarkson. Besides wanting to help the highly regarded Bassett family, many say they also want to preserve the historic property–a prominent landmark on the edge of Woodstock. Jack Anderson, director of the Woodstock Historical Society, says there is only one other working farm left in town. (Anderson) "Long live the Bassetts!" (Albright) Anna Bassett is already setting up house. Her first purchase at the hardware store since the fire? 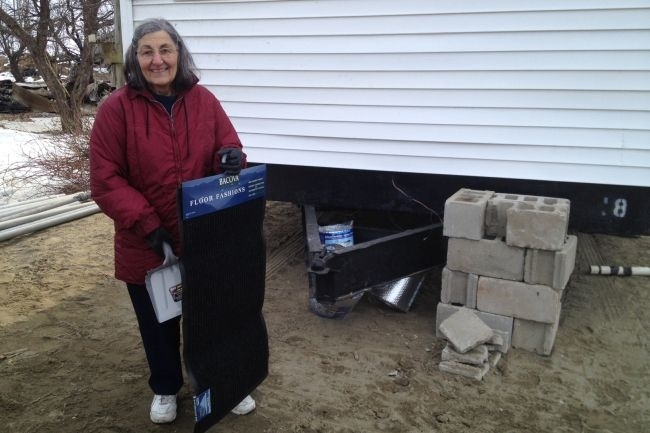 A dustpan and doormat to keep soot and mud out of her new trailer.